We loved the post and read it to each other and looked at the pictures over breakfast, instead of silently reading the paper. A great new family ritual. Elk burgers sound delicious; as do goat and greens. I’m into game myself, more so than hot dogs. Glad you had a good holiday weekend. And the picture of the mountains? I’m so jealous. I need me some mountains. This flat midwestern land is REALLY getting to me. What would the 4th be without homemade hummus? We didn’t make it to the fireworks, either, but it was just as well because Avi is too excited to nap when we visit Saba and Safta. That looked like a great way to spend the fourth…beautiful mountain gathering you had there. I think we need to befriend some decoys ourselves. I’ll be interested in hearing how the new roommate works out…you’ll have to keep us posted. Sounds lovely and exciting (except maybe the putrid hide part)…much nicer than the post-parade all-day candy gorge (Fourth of July=freedom to sink into diabetic coma in these parts). I’d call the paintbrush color a salmony-melony something…”sunset” perhaps? “Normal” is a scary word in the NICU, isn’t it? But it becomes a beautiful word when you see a child blossom before your eyes. Thank you for sharing your life with us. Sounds like it was a wonderful holiday weekend. Col’s pictograph is amazing. I would never think to eat off of rocks. So brilliant! Thanks for celebrating Fours with us! In the Construction of the Universe, four is the birth of the square. It is the flower (1-seed, 2-stem, 3-leaf…). It is the mother substance — three points define a flat surface but it takes a fourth to define depth. There are four people in your family, surely the constructing substance of YOUR universe! Col looks fabulous on a bike! ahhh…i loved ALLof this. thank you!!!!! I adore the last sentence of this entry. Such a perfect moment. I am so glad I discovered your blog. Had to come back because I was reflecting on what you said about milestones and C’s preemie birth . 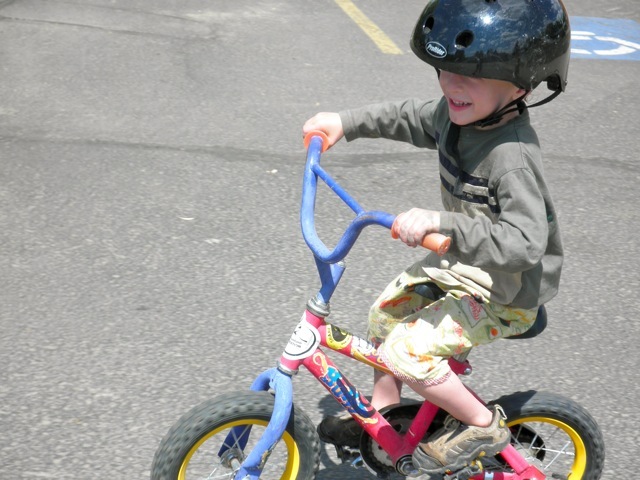 . . hells yeah to his robust adventurousness in bike riding! Oh, your new tenant! That’s hilarious! oh yeah, too much to comment on but I wanted to add, Congrats Col!!!! You are a delight. I have been away from my usual blog meanderings for a while and have just caught up with you and a few other regular reads. There is just something about you, not sure what it is but seriously, I feel like I should be paying to read your stuff. Brilliant indeed. Ohmygoodness, did you just make my day or what?! Thank you for commenting. Sometimes comments like yours are as good as payment. The color is the pink of the flesh of a rainbow trout. Now, I’ve had yellow-fleshed trout too. “I get choked up at any moment that smacks of a normal, developmental milestone (we strive high here).” I felt the same way, and still do, about our 25 year old daughter with Down syndrome. When the milestones present themselves, we rejoice.